Mayonnaise works as a brilliant skin and scalp moisturizer. It is basically a thick sauce prepared from egg yolk, vegetable oil, and vinegar or lemon juice. Mayonnaise, also referred to as mayo, is usually cream, white, or pale yellow in color. You may simply apply a generous amount of full-fat mayonnaise in your hair and scalp to restore moisture, increase shine, and make your hair more manageable. Leave it for about 20-30 minutes and then rinse it off. Finally, shampoo your hair as usual. 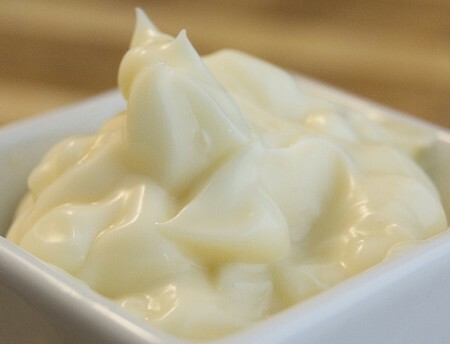 Watch this video showing how to make homemade mayo deep conditioner for hair. Instead of buying mayonnaise from a store, you can make it at your home. For this, you need to whisk an egg yolk in a bowl, about two tablespoons of lemon juice and one tablespoon of white vinegar in it, whisk briskly. Next, slowly pour a cup of olive oil in the mixture while blending it constantly. Leave it for an hour or two and then use it. As it is essential to whisk the mixture continuously while adding the oil, you may use a high-speed food processor for this purpose. • Take half a cup of mayonnaise and add a little shampoo and warm water in it. Use this smooth paste as a homemade conditioner after shampooing your hair. You may leave it on your hair for about 10 minutes and then rinse. You may have to apply a little shampoo again to eliminate the smell. • Another useful remedy for dry hair is to mash an overripe banana, and add three tablespoons of mayonnaise, and a tablespoon of extra-virgin olive oil in it. Apply it on your hair and scalp, and cover with a shower cap for half an hour. Finally, wash it off and shampoo your hair with a mild shampoo. Follow this hair treatment at least once in a month. • Scoop out the pulp of half an avocado and mash it with the help of a fork. Next, stir two tablespoons of mayonnaise and one tablespoon of organic honey in it. Massage this mixture on your scalp and spread it on your hair. You may combine mayo with jojoba oil, olive oil, avocado oil, or yogurt too. • When dealing with head lice, spread mayo on hair, wear a shower cap, and leave it for approximately eight hours. Finally, wash it off with a shampoo. Repeat the procedure after 7-10 days. • Applying a combination of one teaspoon of baby oil and two tablespoons of mayonnaise on your face and neck can be useful for dry skin. You may also apply it on knees and elbows for almost 20 minutes to make them soft and smooth. You will have to wash it off with lukewarm water. • To maintain younger-looking skin, mix eight teaspoons of green tea in a cup of mayonnaise and spread this homemade face mask on your face and neck. After 10 minutes, rinse it off with lukewarm water. This recipe can be used on normal, dry as well as oily skin. Besides, you can use a small amount of mayo to help remove eye make-up. • Take half a cup of blanched almonds. Grind them and add two tablespoons of mayonnaise in the paste. Apply this skin care recipe on your face and neck and then wash it off after 15 minutes to get beautiful, smooth, and glowing skin. You can use mayonnaise with honey or lemon juice as well. Those who have an oily skin can combine mayo with fuller’s earth and then apply.